The Bureau of Labor Statistics’ monthly jobs reports usually don’t make much of a splash, but the latest one, released last Friday, contained a quiet surprise. While the overall jobs picture is unchanged―the unemployment rate remains a steady 4.1 percent one slice of the workforce put up its healthiest numbers in four decades. At 6.8 percent, the latest unemployment rate for black Americans fell to its lowest recorded level since the 1970’s. On top of that, the stubbornly high gap between black and white unemployment also fell to its lowest level on record, clocking in at 3.1 percent. I spoke with Bernstein about the latest unemployment numbers, the somewhat friendlier economic landscape for black workers, and Trump’s unconvincing attempt to take credit for the whole thing. Mother Jones: The jobs report usually rolls by with little fanfare. What was significant about the December report? Jared Bernstein: You never want to read too much into any monthly report, because these data can be pretty noisy. But the African-American unemployment rate fell to its lowest level on record, 6.8 percent in December. Those data begin in the early 1970s, so that was kind of a big deal. 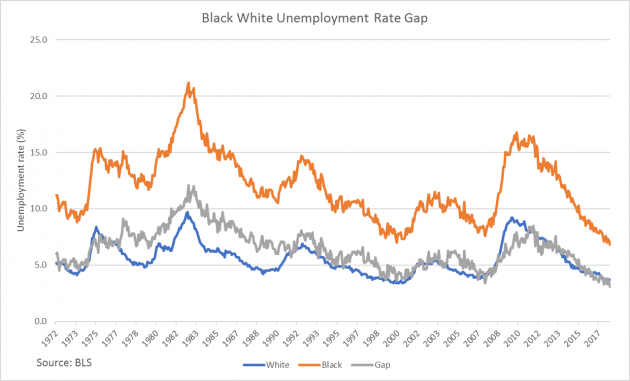 Also the gap between the black and the white rate—3.1 percentage points—was the smallest gap on record. There are a number of points to consider: first of all, the overall unemployment rate was 4.1 percent. So right out of the gate you know that the black unemployment rate is still quite highly elevated even with this positive development. I don’t want to pop the champagne when you’ve got a significant group of people who are still facing almost 7 percent unemployment, but the trend is moving in the right direction and the persistent strength of the job market is reaching folks who have been typically left behind. White people with advanced degrees typically do well no matter what’s going on in the macroeconomy. But African-Americans, Hispanics, immigrants, non-college educated workers depend on a very tight job market, and not just tight for a month or two, but persistently tight to begin to reap some of the benefits of the growing macroeconomy. MJ: Black unemployment is consistently double that of white unemployment. What’s some of the economic and political backdrop for that gap? Certainly, one important piece of it is discrimination. Minorities have been discriminated against in labor markets, but when things really tighten up, employers often find that can’t afford to discriminate against minority workers. They either have to hire someone who they might otherwise discriminate against or leave profitability on the table. That’s one of the ways in which full employment makes discriminating against minority workers an unaffordable luxury for discriminatory employers. There is a reason why Dr. [Martin Luther] King was advocating strongly for full employment toward the end of his life: He recognized that if labor markets are slack, employers can afford to discriminate against minorities in a way that they can’t when labor markets are tight. MJ: What about on the wage front? Do these job gains reflect a meaningful rise in the standard of living for black workers and workers more broadly? JB: We have not seen the job gains map onto wage and income gains as much as I’d like. However, there’s something happening there. Black wages and incomes are rising in real terms. And I think if things continue to proceed apace they’ll do a bit better. If we look at the overall wage data, the low unemployment rate is helping to generate some wage pressures, but not as much as I would’ve thought. And so there’s still room to grow there. MJ: What’s the perfect storm of forces for building a labor market that doesn’t leave behind folks on the bottom? It is not written in stone that the black unemployment rate has to be twice that of the white rate. Six point eight percent is still much too high an unemployment rate. If the national unemployment rate were 6.8 percent, everyone would be freaking out. We ought to not take too much solace in the 6.8 percent, but ask ourselves what can we do to bring that down to white rates, which are below 4 percent now. Some of that has to do with education, but that’s just part of the story. You find that those unemployment differentials persist across every education level. I think it means pushing back on discrimination and helping people who can’t find work get into the job market. And I think it means patience at the Federal Reserve in recognizing that the longer the expansion has room to run, the more beneficial it will be to minorities. MJ: President Trump has been enormously excited about these findings. Is the Trump administration in any way responsible for the December numbers? JB: Of course not. If they had their way, there would be a lot fewer minorities getting health coverage, benefiting from safety net programs or getting help from job training programs or help with school admissions or housing. If you look at the budget they’ve proposed, they’ve aggressively gone after lower-income people. If you look at their tax plan it was very much targeted at their donor base. So Trump has no business taking credit for any of these developments. That said, presidents do that. He’s not the first one but he is in many ways the least justified one because he is trying to push an economic agenda that pushes aggressively in the other direction. All he did was inherit a strong economy from Obama, and thus far he hasn’t completely screwed it up.